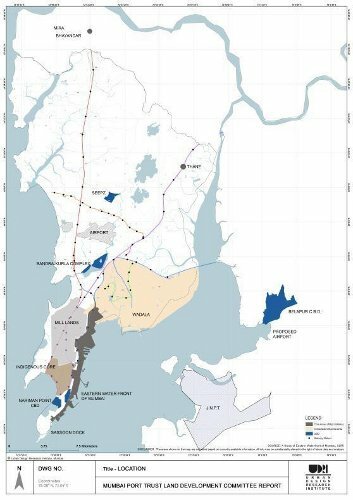 Mumbai’s port land extends over 752 hectares (ha or 1,858 acres), occupying one-eighth of Mumbai’s island city, making the Mumbai Port Trust (MPT) the city’s largest owner of real estate. The port comprises the largest of 12 ports owned by the central government. The 14-km-long eastern waterfront stretches from Colaba at the southern tip to Wadala in the northeast of the city. However, with the development of the Jawaharlal Nehru Port at Nhava-Sheva on the mainland across the creek from the island city, the MPT is in decline. For two decades, the central and state governments have been debating what to do with the land now valued at up to Rs 1 lac crore in the market. MPT earns only Rs 200 crore a year from port revenue and by leasing out such land to corporates like Taj Hotels, Hindustan and Bharat Petroleum. The fate of Mumbai’s port land acquires national significance because it will send a signal when other derelict industrial and infrastructure land in older cities like Kolkata and Kanpur come up for redevelopment. Mumbai based NGOs Youth for Unity and Voluntary Action (YUVA) and Hamara Shehar Vikas Niyojan Abhiyaan Mumbai (HSM) recently released a study report titled People’s Perspective on the port redevelopment in which they question the corporatisation of ports, recommended by the World Bank in its India Port Strategy Report in 1995. The World Bank report suggested large-scale privatisation, easing of government controls, modernization of infrastructure and making way for experts to manage port affairs. Last year, an international consultant was appointed to suggest amendments of the Major Ports Act, 1963. The NGOs allege that once converted into entities under the Companies Act, ports will get financial and operational autonomy. This will enable ports to monetise land, which is their biggest asset, and poor stakeholders like the workers, slum dwellers and fisherfolk will get a raw deal in the process. In a chapter titled “Mumbai in the Dock”, which dealt with this subject in a book I published in 2002, Ripping the Fabric: The Decline of Mumbai and its Mills (OUP), I cited how London’s Docklands were privatised by Margaret Thatcher, virtually doing away with planning. Among other problems, this neglected the need of local residents, many of of them Bangladeshis, and didn’t address their housing or employment. The NGOs have conducted a survey of the encroachments and informal settlements of the poor on MPT land. This, they say, will establish the right of these communities and give them a slice of the pie when the land is up for redevelopment. They call for abandoning current planning practices which have vitiated the holistic development of Mumbai and argue for an inclusive, participatory model which takes all stakeholders into account. It must also prioritise social goals and people’s concerns. The NGOs advocate incorporating these concerns into the draft Development Plan, the earlier version of which was scrapped after public outcry earlier this year and is now being redrafted. However, this is the domain of the municipal corporation, whereas the MPT land belongs to the central government. From the mid-1990s, Mumbaikars lost the opportunity to wrest 162 ha (400 acres) for public housing and open spaces when the land occupied by the mills, 242 ha (600 acres) was to be redeveloped, according to Mills for Sale: The Way Ahead (Marg, 2007), edited by me. The mills occupied only a third that the docks do, and the redevelopment of the latter should avoid the mistakes committed in the former instance. In 1991, the Maharashtra government instituted a one-third formula, whereby mill owners or developers had to surrender a third of the plot they occupied for low-cost housing, another third to the municipal corporation for amenities like open space, and sell or develop the remaining third. However, they received floor-space index or buildable rights in relation to the size of the plots on the two-thirds they gave up. In 2001, the state government introduced a new clause, which required owners to part with two-thirds of only vacant land. Since mills – for that matter, factories or ports – have a large footprint, Mumbai lost out in the process. The metropolis has only 1.2 sq metre of open space per inhabitant today, one of the lowest in the world, specially for a mega city with more than 10 million people. The two NGOs have analysed the proposal of a committee headed by the former MPT Chair, Rani Jadhav, which was submitted last year but has still not been made public. However, repeated leaks have revealed its findings. It ascribes the dereliction of MPT docklands to changes in the shipping industry, mainly to the switch to container traffic, which Mumbai can’t accommodate due to its shallow draft. This explains why bigger ships move to Nhava-Sheva. The NGOs question the excessive emphasis in Jadhav’s report on catering to the tourism industry, with a “world-class” cruise terminal for luxury liners and a giant Ferris wheel on the lines of the London Eye. It also recommends a floating hotel or “floatel”, food courts and creation of 161 ha (400 acres) of open space. Many such activities may exclude locals not only from employment but access. Jadhav’s report begins by pointing out that port cities worldwide face the global syndrome of the de-industrialisation of city centres. The relocation of industrial activity due to modernization of manufacturing and goods handling methods has led to dereliction and redundancy in vast tracts of inner city harbours. MPT’s inept handling of changes in cargo and shipping has resulted in a shift of such activities to new ports, leaving land open for a variety of entertainment and waterfront activities that, it says, can be enjoyed by all classes of society. The report cites how MPT handled 59 million tonnes of cargo in 2013-14, around a tenth of that handled by major ports. As much as 77 percent of its cargo -- 61 percent of ‘liquid bulk’ like oil products and 16 percent for transshipment to other centres – is handled offshore, which shows that the port can remain operational despite opening large tracts for redevelopment. The revenue from liquid cargo makes up for the losses on general goods. MPT also has to pay large pensions to its retired dockworkers. The report recommends that future activities should be offshore, for which the MPT has built a long jetty, enabling larger oil tankers to dock, releasing the pressure on the waterfront and making it available for public purposes. As much as 275 ha have been leased to public sector companies, oil and petroleum industries and the defence authorities. Another 136 ha have been leased to private parties for commercial uses. After litigation, the MPT was able to retrieve 64 ha from tenants. According to an incomplete survey by the port estate department in 2002, 7.5 ha have been encroached upon, with 14,365 hutments. 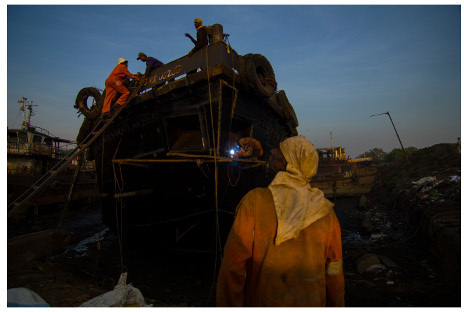 Certain areas on the waterfront have been transformed into informal small-scale industrial units for ship-breaking – a hazardous and often banned activity – and ship repairs etc that even supply materials and skills for the country as a whole. These workers have been classified an informal and migrant, and the informal economy occupies this 7.5 ha. The Jadhav report envisions opening up 28km of the waterfront – twice the current length – much of which is occupied by derelict docks. A 121 ha area will be created into an environment zone and at least 30 percent of the land will be converted into parks, playgrounds, plaza, maidans and so on. Its vision is described as Open – for new recreation and tourism uses; Connected – for seamless local, regional and national connectivity, through multiple transport modes on land and sea; and Green – with promenades and open spaces. A citizens’ initiative called APLI – A Port Land Initiative – Mumbai took a more people-friendly approach towards redeveloping the area with mixed-use residential areas which would include “project affected people”, a heritage corridor centred around the much-neglected Sewri Fort, a watersports facility to replace the toxic ship-breaking yard and a marina, along with a cruise ship terminal. It had the backing of the Indian Merchants’ Chamber and the Graduate School of Architecture of Columbia University. The two NGOs take a different view of what they term a vibrant informal economy that has been in existence there for decades. They oppose the proposal to create a centralised planning agency, the MP Land Development Authority, which will bypass the municipal corporation. The authority can constitute a Special Planning Authority under the Maharashtra Regional and Town Planning (MR&TP) Act, negating any role of elected representatives. By declaring the port “sick”, exactly like the 54 cotton mills were, the government is opening up a Pandora’s Box of privatisation, they fear. Most mills, almost entirely those in private hands but also those in the public sector, have been transformed into malls, glitzy office complexes and high-end residential towers. The rehabilitation of these workers when they are displaced hasn’t been addressed. There is no consistent housing policy, and those living in the port communities live a “sub-human” life. There are ten toilet seats for around 15000 people. The NGOs estimate there are 30000 slum households – twice what the 2002 survey assessed -- with 150000 people on this land. Mumbai city is a stakeholder too, they assert, in sharp contrast to what happened with the mills. The two NGOs argue that Section 33 of the MR&TP Act also gives a local planning authority powers to prepare detailed micro-level plans for areas requiring “comprehensive development”. This follows the same process as preparing the 20-year Development Plan, which requires public hearings at the local level. They have cited international experience to bolster their case. London, New York, Toronto, Sydney, Singapore and Barcelona are some cities which have rejuvenated their docklands with varying results, as we have seen in London’s case. The City in London – with a capital C, the world’s financial capital – is situated there and there is little local employment or housing. The Jadhav committee looked somewhat closer home, at ‘smart city’ examples of Hong Kong, Singapore, Kuala Lumpur and even Australia, where digital technologies boost port efficiency and reduce the use of resources. 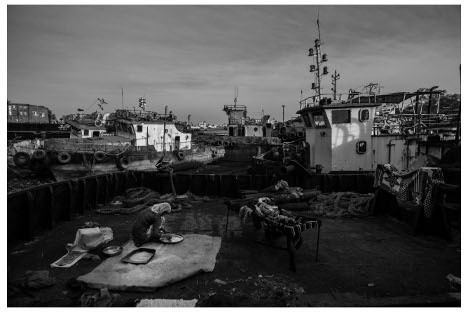 The NGOs specially cite the redeveloped port area of Ciudad Vieja, in Montevideo, Uruguay, which is home to primarily poor residents in spite of banks, trading companies and other business enterprises in the vicinity. There is a special scheme for this area, within the overall Montevideo plan. The heritage of this historical city centre is preserved and the decline of its population arrested by projects to resettle inhabitants. There are moves against urban segregation, while more public space has been opened to the public, with improved public transport and restrictions on the entry of cars. In Singapore, which has the advantage of a deepwater port, efficiency has ensured the vibrancy of this area. Long term planning, rigid political control and decisive administration are the key political elements that have earned the city-state its exemplary status for urban planning.